I give so much thanks to all of the friends and like minded friends I have made through this blog. Some have sincerely become people I consider friends. Even if we have never met face to face. I am just two days out from my 3 year anniversary in the gym. That post I have written and re-written multiple times Who knows what form it will take, however there are alot of things I have learned over the last three years. Most of which is, you don’t know everything ever… just keep trying. So, this is just a blabber post about life in general, because well… that’s how the blog started. One post about why I wanted to blog that basically said, put it out there and maybe my mom or then bf would read my drivvel. So, this week’s tip. Food Prep. So, my food for at least the next few weeks. Egg whites, green beans and spinach twice a day, extra lean ground turkey with green beans, onions, asparagus and a lil salsa and Italian seasoning twice a day, whey protein, peanut butter and tuna steaks. Two weeks to rip it into shape. 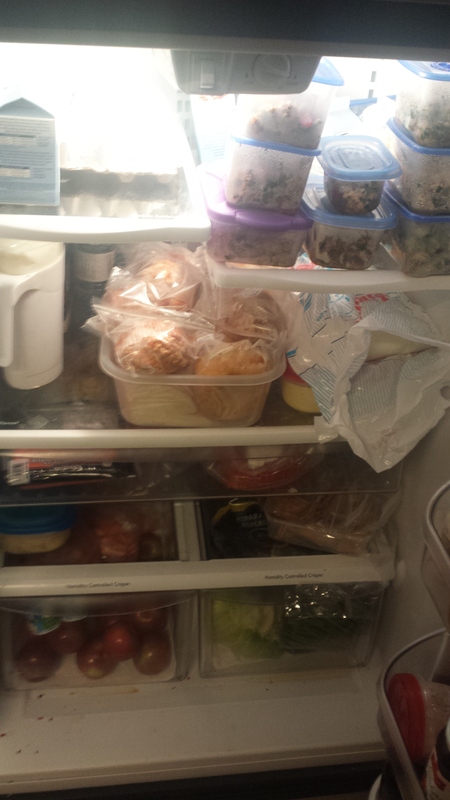 I also made 8 cheese bagels with cream cheese, 8 sandwiches with different meat, condiments and ingredients, packaged muffins (the big costco ones in half per bag), cookies, carrots, separated yogurt containers and loaded up on bananas and apples for the boys. Should make lunch making easy in the mornings, I hope. Cause stead rate is going out the window for full blown fat burning HIIT.